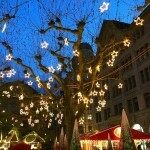 When I think of European Christmas markets and holiday atmosphere, Zurich is not the first place that pops into my mind. But guess what? 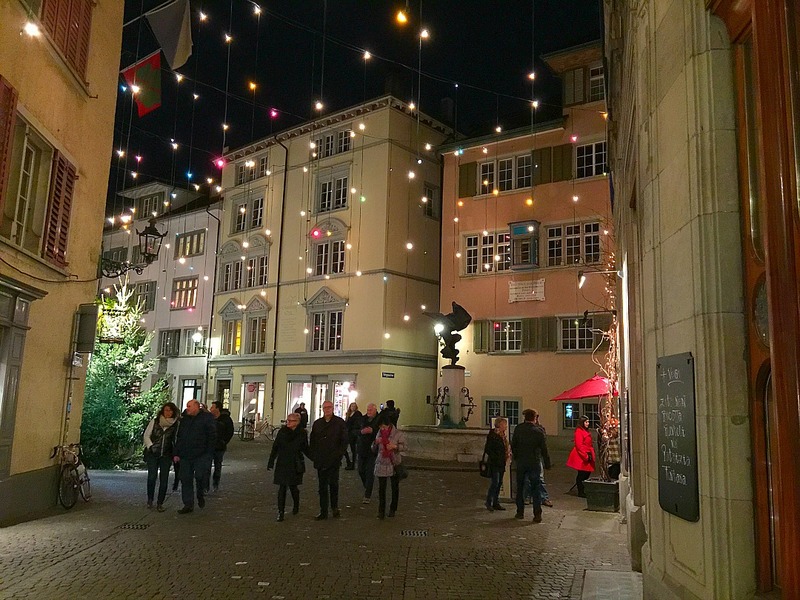 Christmastime in Zurich is magical. 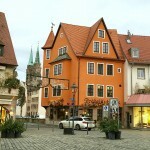 By day, walking through the city, you see holiday expression done elegantly. A children’s tradition is making candles from beeswax, and there is a special hut where everybody goes for candle dipping. 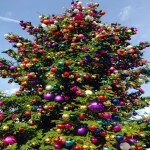 A huge Christmas tree stands regally outside the opera house and you see lovely decor everywhere. But it’s never too much. By night, the city becomes a wonderland. 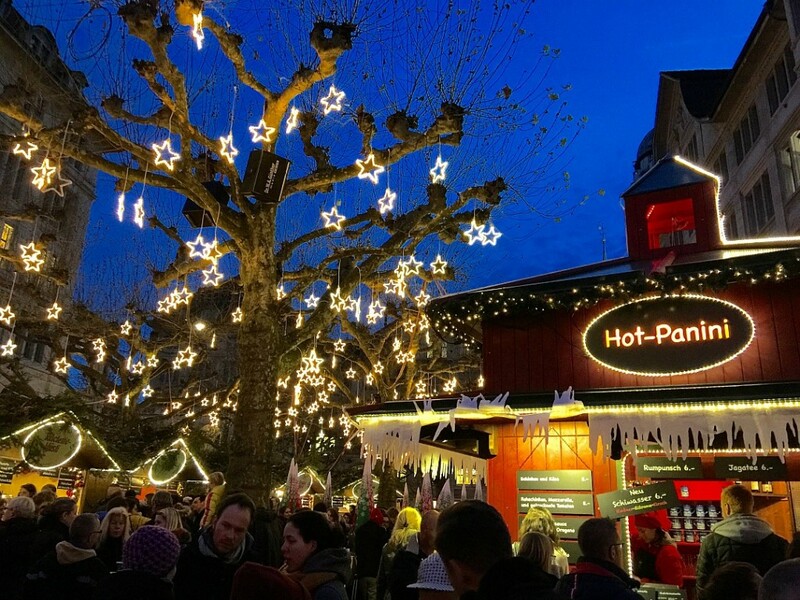 Cozy little Christmas markets filled with local families grabbing a bite to eat, lighted Christmas trees high on top of cranes, the smell of bubbling fondue made with pungent Swiss cheese, and cinnamon and spices from mulled wine fill the air. Christmas caroling is tradition, and it’s likely you’ll encounter some singing during a nighttime walk though town. 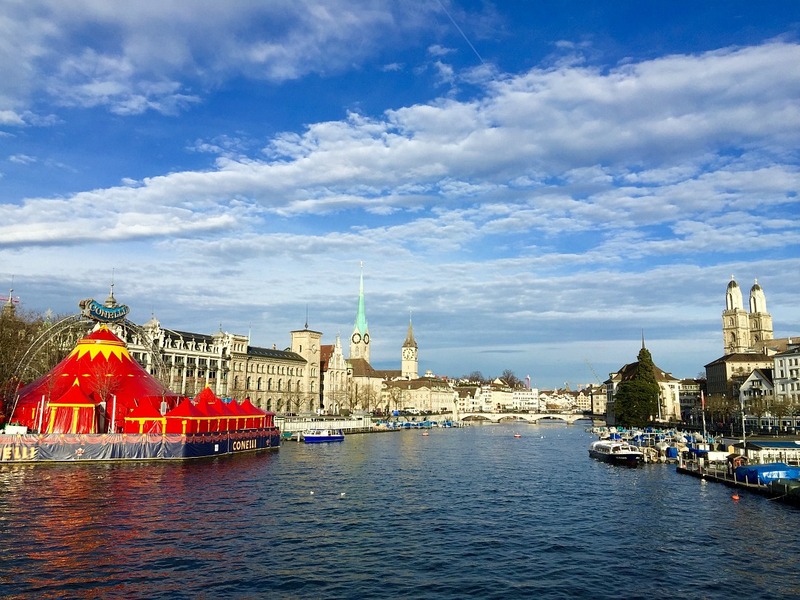 The Limmat River is lined with glowing decorations. It’s a beautiful walk along the river and over the bridge, an\ a nice vantage point to view the city and the lights bounce off the water creating a fluid, moving light. One of the biggest markets in Europe is located inside the main train station. 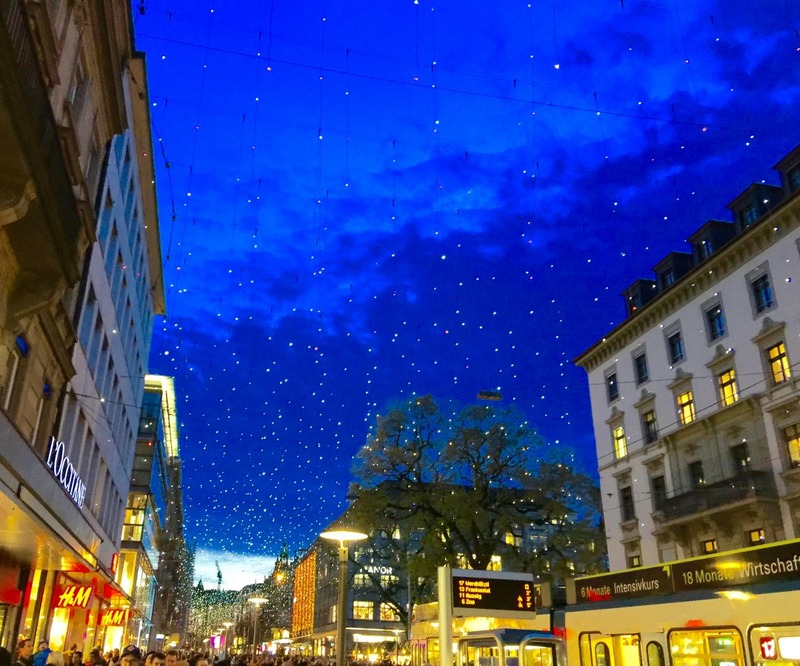 But for me, the real magic is outside, walking down Bahnhofstrasse with over 12,000 twinkling lights overhead. You feel like you are walking through constellations and it is amazing. Illuminations are made up of hanging crystals with LED lights that twinkle with varying intensity and shooting off little flecks of color here and there. They call it “Lucy,” but I don’t know if it has anything to do with the song. If you go during twilight, like I did, it is stunningly gorgeous. The sky is purple-blue and the lights look so beautiful with that lighting as a backdrop. It was a fleeting moment, and one I will never forget. But after dark, there is another magical place to go, where the lights glow softer and it’s just as magnificent–Old Town. 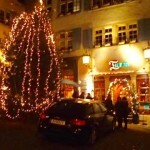 The Niederdorf quarter in Old Town is home of the oldest Christmas market in Zurich. It glows with the old fashioned lights that are canopied overhead. 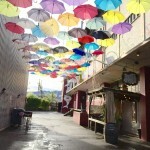 This creates a more dreamlike version of what is going on over on Bahnhofstrasse. Niederdorfstrasse is a pedestrian-only area, so you can walk freely and get lost in the sensory experience of the smells from the market and the picture-perfect vignettes in front of you. 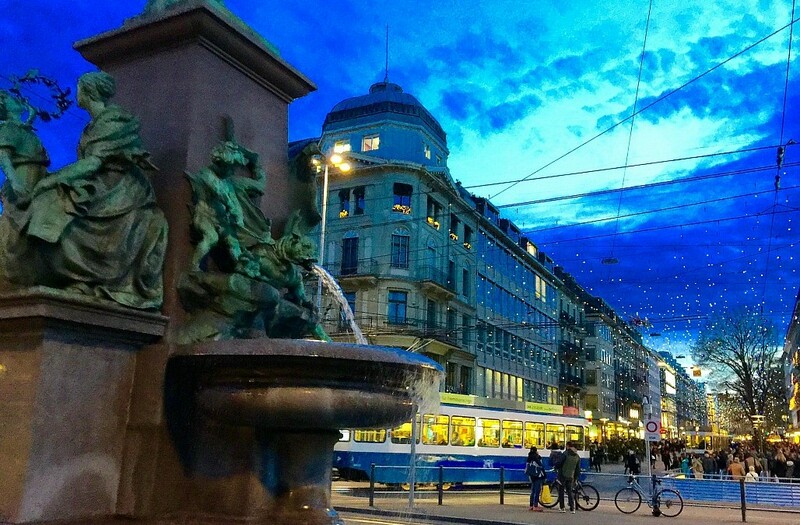 I’ll never forget my time in Zurich during the holidays and will always long to go back and experience it again. 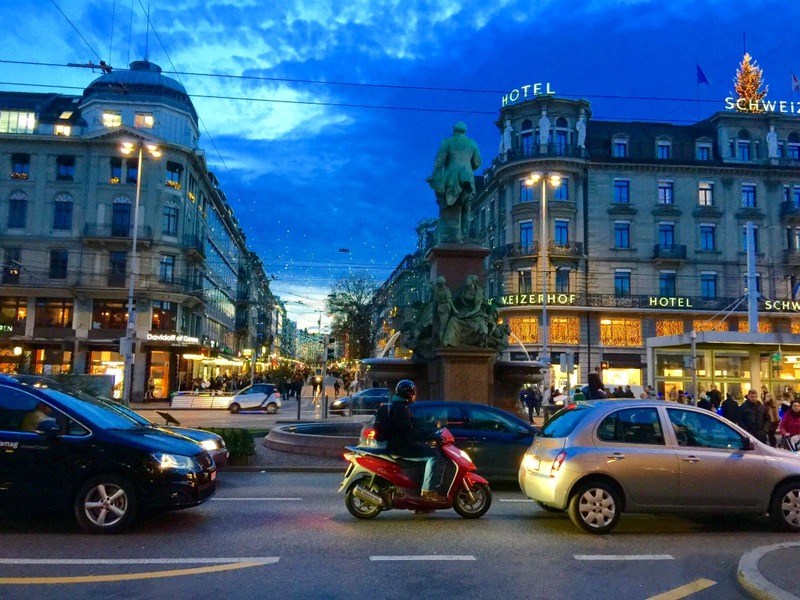 I strongly recommend going to Zurich during the holidays just to experience Bahnhofstrasse and Old Town alone. 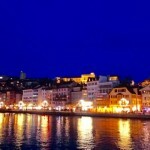 Enjoy some traditional Raclette, a cup of mulled wine, stroll the streets and mingle. Pop into the indoor market at the main train station and get a Swarovski crystal ornament like the ones on the giant Christmas tree. Stop and listen to carolers. Have a cup of famous hot chocolate at Sprungli. 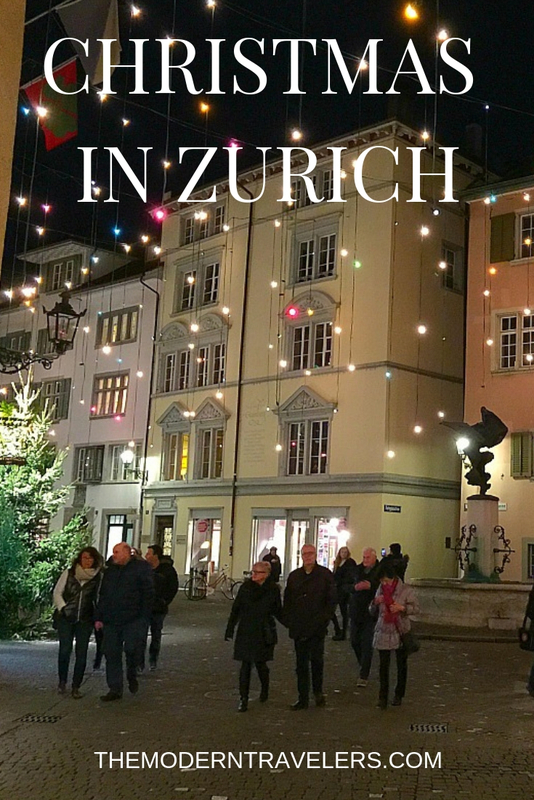 There are so many things Zurich has to offer to celebrate holiday spirit, and it’s done in such a way that it really feels like a celebration and not a commercial enterprise. 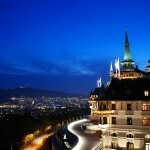 Winter is a wonderful time to visit the city, check the Switzerland Tourism website for more information.